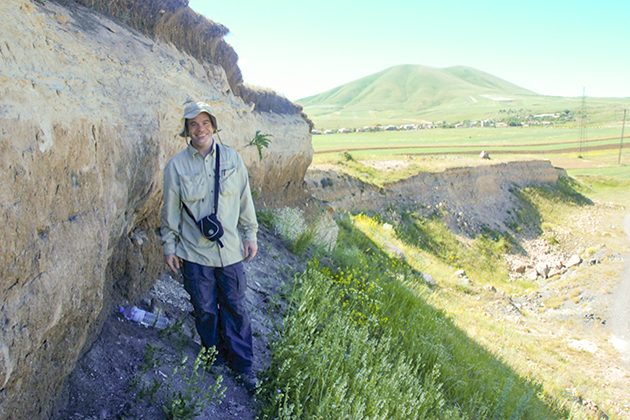 Anthropology Ph.D. student Phil Glauberman during a recent field work trip to Armenia. If you ask a student who’s studied abroad what their most exciting college experience was, they’ll probably tell you their travels blew everything else out of the water. Anthropology Ph.D. student Phil Glauberman had this experience as an undergraduate at the University of Pittsburgh. In 1999, Glauberman visited Belgium for his first-ever excavation trip. He was captivated. Glauberman, who will defend his thesis in May, has been awarded a two-year Marie Curie International Incoming Fellowship by the European Commission. He will use the fellowship to establish a research program at Middle East Technical University in Ankara, Turkey, that will address still-controversial questions about the human ancestors, Neandertals. His work will look at the archaeology of areas in Southwest Asia – Armenia and Turkey – that early humans likely traversed in their paths out of Africa, but that have rarely been studied by archaeologists. “These are such crucial regions geographically to answer questions about early human populations,” Glauberman says. Anthropologists tend to agree on the “Out of Africa” theory of human evolution: that the first proto-humans, or hominins, came from Africa and traveled through modern-day Southwest Asia and Eastern Europe before dispersing to Western Europe and the Asian continent. But, says Glauberman, the areas of Anatolia and Armenia haven’t traditionally seen a high intensity of fieldwork and excavations. Glauberman wants to know what the Neandertals and early humans were doing in these areas during the Paleolithic, also known as the Stone Age. He’s interested in how the raw materials these early people used to make tools – for example, flint in Europe and obsidian in Armenia and Turkey – affected their way of life. Over the next two years, Glauberman will work near one area in the Hrazdan Gorge, currently under study by an international team including researchers from UConn, at a newer site just to the north of Mount Ararat in Armenia. He also plans to survey near this site on the other side of the Turkish border. Along with U.S. and European scientists, his team of researchers includes Armenian and Turkish scientists. “The archaeologists and specialists that live in both these places like the idea of scientific collaboration across borders,” Glauberman says. At the end of his fellowship, he plans to convene a conference at Middle East Technical University about archaeology in the area. “It will be nice to have all these different people in one room talking about the same things and presenting recent work,” he says. Together with Dan Adler, associate professor of anthropology, Glauberman has traveled to Armenia each summer for five years, and three of those trips have included field schools for UConn undergraduates, supported in part by UConn’s Alice Norian Armenian Studies Program. The students live with a host family in the capital city of Yerevan, immersing them in Armenian culture for the month-long course. Yerevan isn’t what people might call a vacation destination, says Glauberman – so the students really get a sense of what life in Armenia is like. Glauberman plans to recruit students from Middle East Technical University for his fellowship work, so that he can continue exposing students to his passion of field archaeology.